Kirkpatrick Macmillan lived from 2 September 1812 to 26 January 1878. He was a blacksmith credited by many as the inventor of the rear-wheel driven bicycle. The wider picture in Scotland at the time is set out in our Historical Timeline. Kirkpatrick Macmillan was born at Keir Mill near Thornhill in Dumfries and Galloway. His father was a blacksmith and at the age of 12, Kirkpatrick became an apprentice to him. It is worth noting at this point that just about every aspect of the story of the invention of the bicycle is subject to considerable controversy, but what follows is a fairly popular interpretation of events based on research initially published in 1899 by a descendent of Macmillan's, James Johnston. Some time in the late 1820s, Macmillan saw someone riding a velocipede, a bicycle that was propelled by the rider's feet pushing backwards on the ground, and decided to build one for himself. Having done so, he realised that there was scope for significant improvement. In 1839 he completed his improved bicycle. Made of wood, it had iron-rimmed wooden wheels, a steerable front wheel, and a rear wheel that was connected by a series rods to pedals, which the rider pushed alternately forwards in an horizontal reciprocating movement. 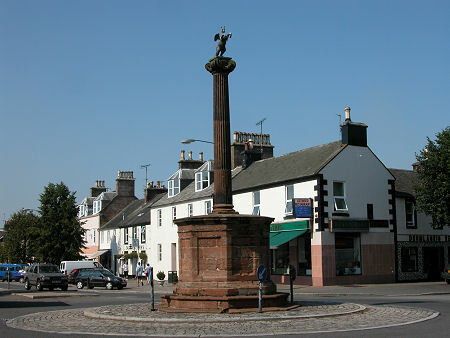 Before long, Macmillan was regularly to be seen riding the 15 miles between his home and Dumfries. In June 1842, Macmillan seems to have ridden the 70-odd miles to Glasgow. A newspaper report talks of "a gentleman from Dumfries-shire bestride a velocipede of ingenious design" who knocked over a little girl in the Gorbals area and was fined five shillings. Many believe this was Macmillan, though others question whether a newspaper would describe a blacksmith as "a gentleman". Macmillan did not patent his invention, and in 1846 Gavin Dalzell of Lesmahagow produced a very similar machine, leading to a belief that persisted through much of the 1800s that he had invented the powered bicycle. In 1854 Macmillan married Elsie Goldie, and they had six children together. He died in 1878. The smithy where he worked is still standing and carries a plaque which reads: "He builded better than he knew". Two of his bicycles are on display in Dumfries Museum.